"I'm not saying this is Sawyer's fault," the prim and proper one said delicately. "But." Eighteen-year-old auto mechanic Sawyer Taft did not expect her estranged grandmother to show up at her apartment door and offer her a six-figure contract to participate in debutante season. And she definitely never imagined she would accept. But when she realizes that immersing herself in her grandmother's "society" might mean discovering the answer to the biggest mystery of her life-her father's identity-she signs on the dotted line and braces herself for a year of makeovers, big dresses, bigger egos, and a whole lot of bless your heart. The one thing she doesn't expect to find is friendship, but as she's drawn into a group of debutantes with scandalous, dangerous secrets of their own, Sawyer quickly discovers that her family isn't the only mainstay of high society with skeletons in their closet. There are people in her grandmother's glittering world who are not what they appear, and no one wants Sawyer poking her nose into the past. As she navigates the twisted relationships between her new friends and their powerful parents, Sawyer's search for the truth about her own origins is just the beginning. Set in the world of debutante balls, grand estates and rolling green hills, Little White Lies combines a charming setting, a classic fish-out-of-water story, and the sort of layered mystery only author Jennifer Lynn Barnes can pull off. 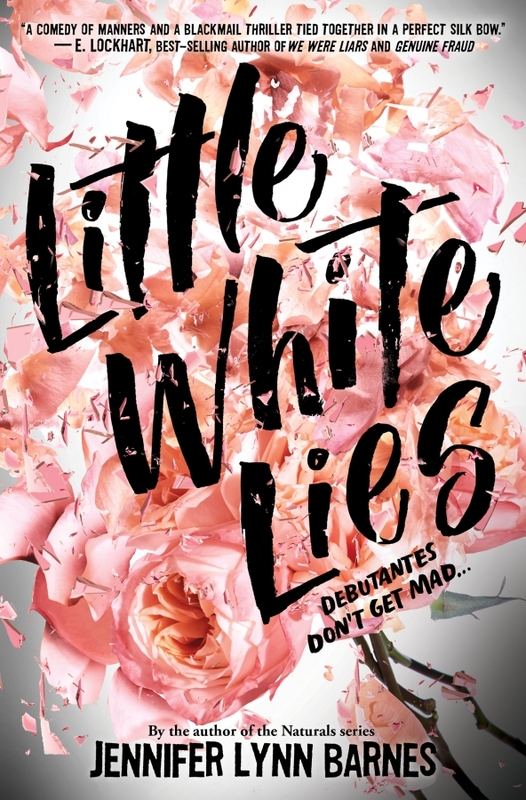 LITTLE WHITE LIES by Jennifer Lynn Barnes is a novel mashup of Gossip Girl and Pretty Little Liars set in the world of Southern belles and debutantes. The book kicks off when eighteen-year-old Sawyer Taft is propositioned by her very wealthy and estranged grandmother to come live with her for a year in exchange for half a million dollars. Sawyer, who’s been surviving paycheck to paycheck, agrees, especially when she realizes this could be her one chance to figure out who her father is. However, being born out of wedlock to a teenage mother proves too scandalous to talk about, especially when multiple society people are protecting their own secrets. In a place where money means power, Sawyer must learn to play their convoluted games in order to get what she wants. This novel is the definition of “voice.” The writing is fresh, distinctive, and fun. From the first page to the very last, I love the author’s humorous tone and the protagonist’s consistent sarcasm. I found myself laughing out loud and always tickled by Sawyer’s quips. Sawyer, though mocking of her new lifestyle, also embraces it in a lot of ways. Of course, she’s being paid to do so, but she adapts quickly, making friends and bonding with her new family. There’s a trend in young adult novels, especially contemporary, to make the female protagonist too cool or uninterested in girly things, such as makeup, clothes, and boys. What I especially like about Sawyer is that instead of being overly cynical, she has relatable commentary. For instance, she talks about how annoying it is to wear a strapless dress, which is, in fact, the worst. When her feet are hurting, even though it’s an improper moment, she takes off her high heels, which is something I’ve done or wanted to do a million times at events. Her character is way more evolved than the boring tomboy trope, and also someone I understand. The intrigue could have been more surprising as I was able to guess the plot twists. Also, most of the debutante’s master plan didn’t make sense to me. For example, I’m still not sure what the point of being in jail was, though I did like those flash-forward scenes. That aside, I enjoyed getting to each moment with these characters. Every single person had a purpose and motivation, and as a result, I actually missed them when they disappeared from the story for a while. LITTLE WHITE LIES is a Freeform book and it is easy to picture this story as a television show. I’m hoping this first book will be the start of a new series. I would love to see these characters take down more of the prim and proper.